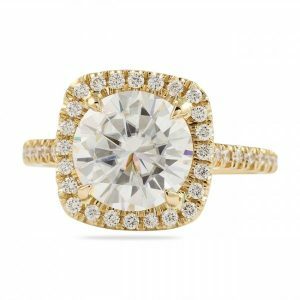 Adding Detail to Your Engagement Ring; How to Make Your Ring Stand out | Jewelry Blog | Engagement Rings & Diamonds | Like It Gold! Picking out an engagement ring design can be difficult. There are tons of design options! We notice people can gravitate toward the same designs over and over. 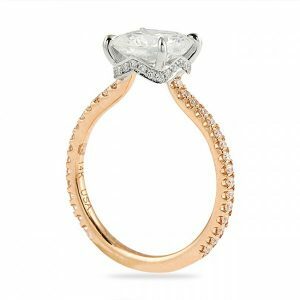 We are known for incorporating special design details to make your engagement ring unique. Read on to see how you can achieve a unique engagement ring. 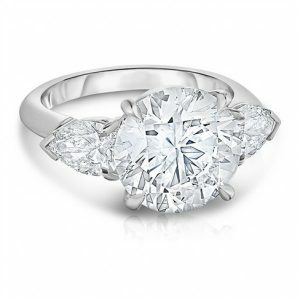 The round diamond set in a cushion halo is popular. Adding a square corner to the round brilliant gives a full appearance. 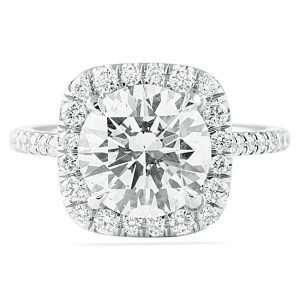 In addition, the brilliance of the round diamond is unrivaled. One of our most popular designs is the RS-125. This model features a single pave halo, diamond stems, with a cathedral diamond band. After something more unusual? In order to achieve that, Look at this custom version. This model is done in all yellow gold. Coupled with pave flower stems connecting the halo to the band. The RS-252 engagement ring design is one of the first invisible gallery rings from our collection. 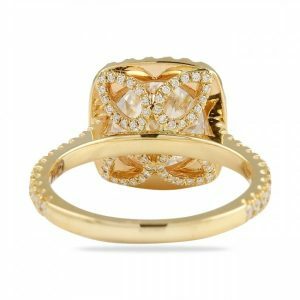 The thin pave band, delicate pave basket, set low to the hand is one of our most popular designs. Not to mention we have created this design for every diamond shape and it is easily one of our most requested designs! For a more unique engagement ring, how about our wave basket design? This model features a thin pave band and pave basket as well, however, the basket is done in a V shape to add extra flair from the side profile. Three stone engagement rings are a classic look and it is difficult to create something unique. Check out this 4.5 carat round diamond set with pear shape side diamonds from our eternal diamond collection. Furthermore, this classic model also allows for a flush fit wedding band! 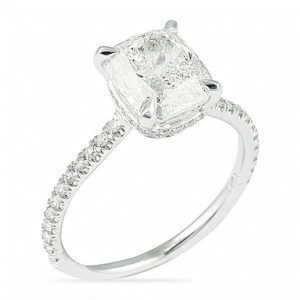 We love the appeal of this classic three stone. A great way to add some extra flair is by changing up the profile. 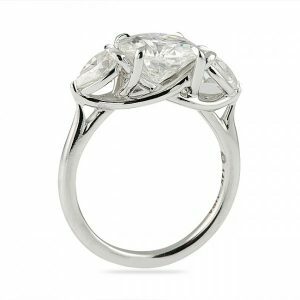 This custom round and pear shape moissanite three stone ring features a criss-cross basket for a really special look!